Do apes go bananas over scary movies? Have you ever re-watched old movies and cringed, anticipating the scary parts? Psychologists from Japan’s Kyoto University wondered if apes also get the creeps. Apes are known for their long term memories. Plus, they remember aggressive events better than neutral ones. So would they remember scary movie scenes? To find out, the researchers made two, thirty-second scary movies. In Movie One, a man dressed as King Kong bursts through a door and attacks a person. In Movie Two, Kong attacks—but the victim gets a toy foam hammer and fights back! 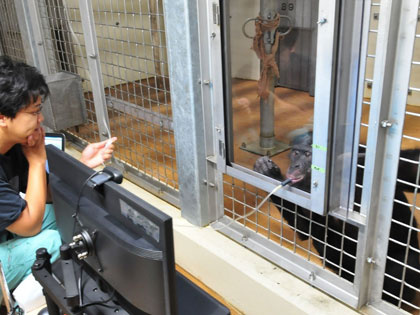 The researchers played each movie twice for chimpanzees and bonobos. Special eye tracking cameras recorded where the animals looked. What happened? During the re-run of Movie One, the animals watched the door, anticipating King Kong’s entrance. They clearly remembered the scary moment! In Movie Two, they watched the hammer, anticipating the human using it. The researchers say this memory skill likely helps apes avoid dangers in the wild. Unlike teenagers in horror movies. Tiffany and Chad, don’t go necking in that dark basement! Ah! Not again! !